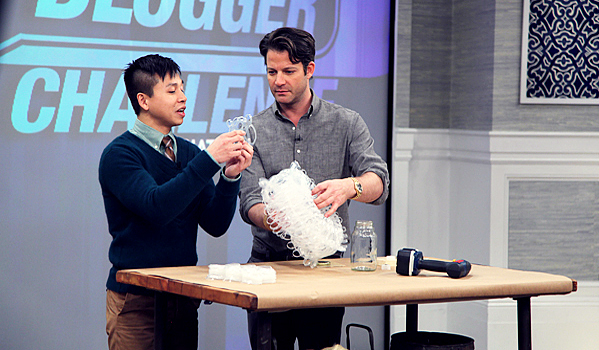 I'm finally getting around to writing about my day on The Nate Berkus show from my point of view. The previous posts about the day were by Reid and Josef. On the show I reminded Nate he had given me one week to work on the challenge. That's mostly true. Almost all the projects that you saw in the show sitting on set were finished during the week before the taping. You might have seen me on TV for 10 to 15 minutes, but it took weeks of intense preparation. To give you a bigger picture, I'll take you behind the scenes and back in time. 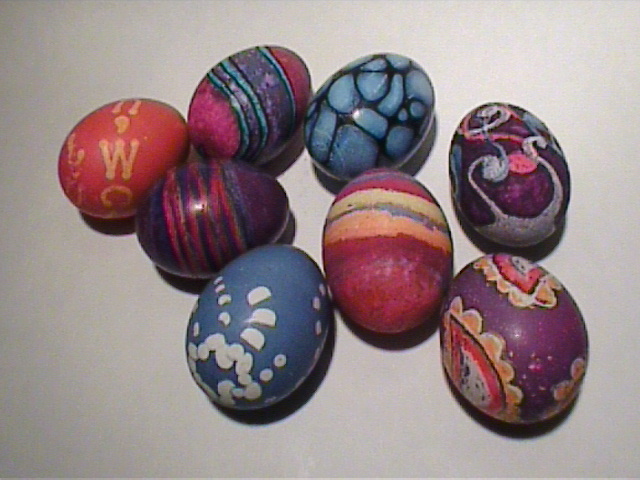 I had decorated a bunch of Easter eggs, and Nate got hold of some photos I had on an earlier design blog. That got me on his radar. A few months later I officially launched Relevé Design's blog and shop. My pendant lights made a few splashes here and there. I guess he thought I was ready after that, cause he threw down the gauntlet and challenged me to a duel (aka Design Blogger Challenge)! Make five upcycled items to decorate a living room. I have sketchbooks full of projects and ideas from years of sketching and writing. I work in several sketchbooks at a time, cause I never know when inspiration will hit! I already had quite a few projects made. I thought I was pretty well-prepared. Design challenge? Bring — It — ON! It's going to be a breeze! Boy was I wrong! I love antique wire trays, but they are so expensive, especially in the NYC where the vintage and distressed look is still all the rage. I decided to make my own with white powder coated clothes hanger. I showed this to the producers, but it didn't make the cut. Now it's sitting in my bedroom. I keep some of my neckties in it. I'm always getting junkmail and bills, but I really love the cool patterns on the inside of security envelopes. I make my business cards out of them, but I thought it would be funny if I made security envelope envelopes and notecards. They actually turned out really nicely. Obviously, this isn't decor, so it didn't make it onto the show. Another strike out! OUCH! My friend Sara invited me and my boyfriend to stay with her family at their summer home in Marbelhead. Marblehead is an old New England town with a great nautical history. I was inspired by the all the shipmaking, sailing, and yacht clubs. It was gorgeous! 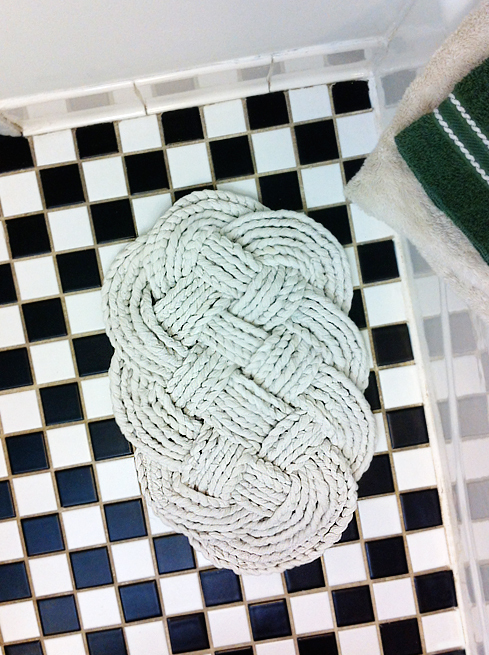 When I got home I had the idea to make an soft t-shirt ocean plait bath mat to replace hard wooden teak one I had. I thought it looked pretty cool, Obviously it's not going to work in Nate's living room. That was a total miss! Since I rent my apartment, I don’t like putting lots of holes in the walls. I came up with a system to hang everything from one hook. I was going to put it up in my living room, but my boyfriend wasn’t so enthused about that. I hung it up in my studio instead. Honestly, sometimes things can look wonky, especially when you know what it’s made of and how it’s made. When you actually put it up and stand back, it’s really cool! 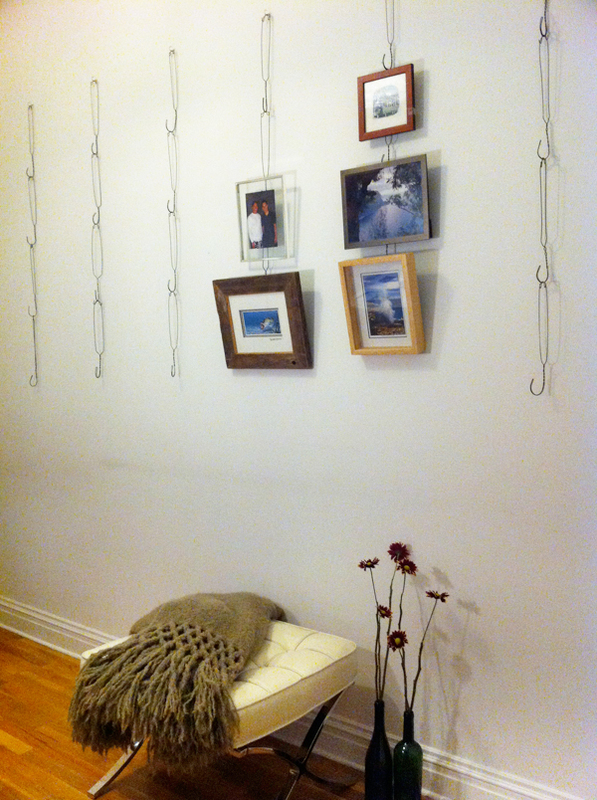 I made mine out of dark wire hangers and hung then from brass hooks. It’s perfect for Nate’s living room. SCORE! I made a white version for him. He and his crew made it look totally awesome on set with the grey wall. The first tray didn't quite work out. It a functioned more like a basket than a tray. 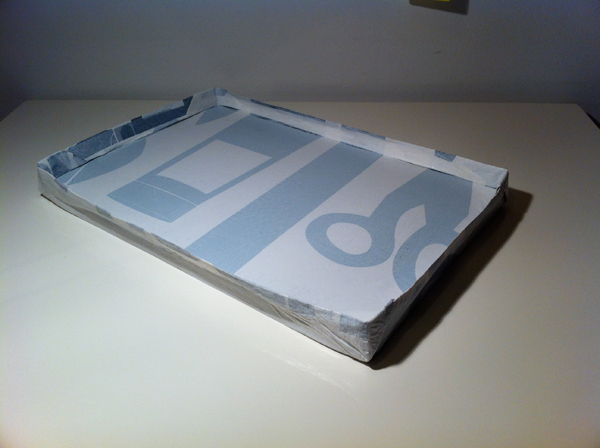 I went back to the drawing board, and came up with a folded fused plastic tray based on leather catch alls. 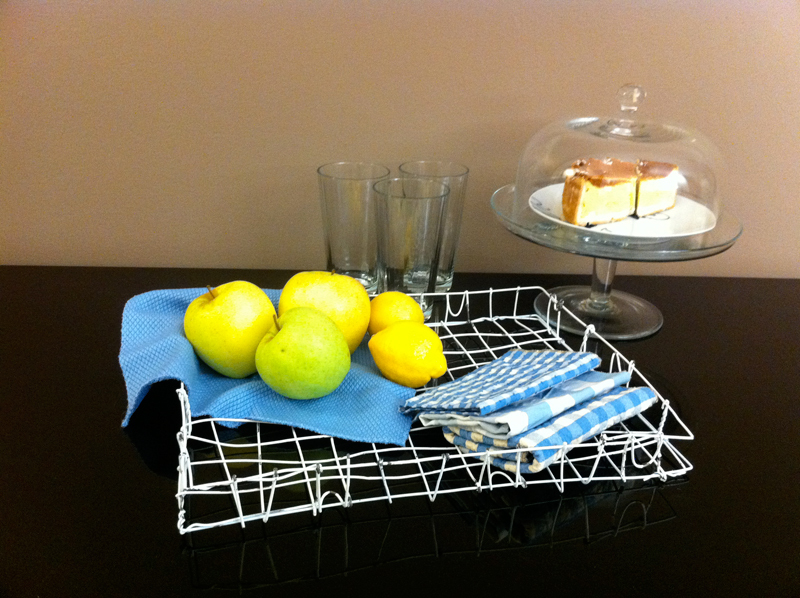 For it to function as a serving tray it would need a whole lot more structure. It evolved into an ugly plastic and cardboard craft fail! 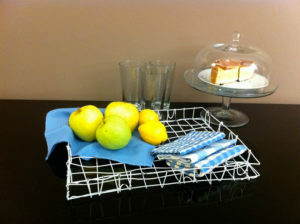 But I managed to iron out all the kinks for the tray that ended up on the show. Rolled paper vases and bowls are really common, and you can find them in home goods stores. I think they’re a bit overdone, yet I’m still in love with the idea! I was determined to freshen it up. 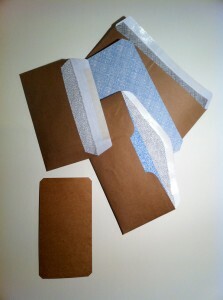 I’ve sketched ideas to stack junkmail and magazines instead of rolling them, but it needed just a bit more OOMPH. I found inspiration in the silhouettes of two handmade wood layer stools at the Museum of Art and Design. 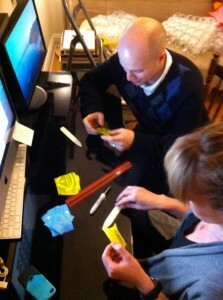 I had to wrangle in my friend Joseph to help cut up junkmail for the prototype. 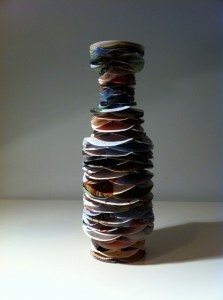 Nate liked it, and I was so excited about the magazine vases I made him two. Win Win! I never understood the whole spherical knickknack thing, until I got a dining room table! 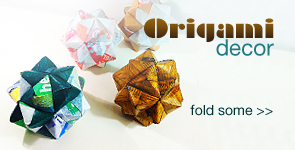 Instead of buying them I thought I could whip something up with origami. Never one to go about things the usual way, I decided to use plastic bags instead of paper. My coworker Ryan and his wife Lauren are super skilled and incredibly crafty DIYers. I pulled them in to help me decide on shape to make with the plastic. It was much more difficult than we thought it would be! I went back to the drawing board and made paper prototypes first to show Nate. With his official approval I finished it up with plastic and shellacked paper versions. 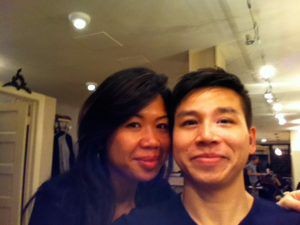 I went to my stylist Mune to get a fresh new cut a week before the show. She’s worked with lots of people in show biz, so I knew I she’d be able to give me advice and a great style for my first TV appearance. Our friend Makky came along with my boyfriend and I for the last minute wardrobe hunt. Hailing from London Makky is a veteran fashion maven and renowned make up artist. I was pulling in the big guns! 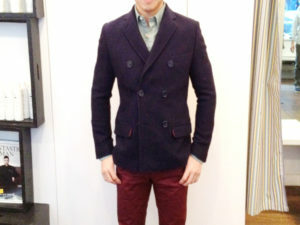 I got a sport coat from Ramdane, shirt from Gant, and oxblood pants from Unis. In the end we went a more casual with the forest green Ramdane sweater, Unis khakis, and Tretorn shoes. It was comfy! I got to the tv studio early. There was a lot of waiting, but it went by fast. I had Joseph with me just in case, since he assisted me on most of the projects he’d be able to help if anything fell apart. The t-shirt throw is mostly his handy work. I did a third of the throw before I showed him how to do it, and he finished it off. The throw can definitely be a group project. 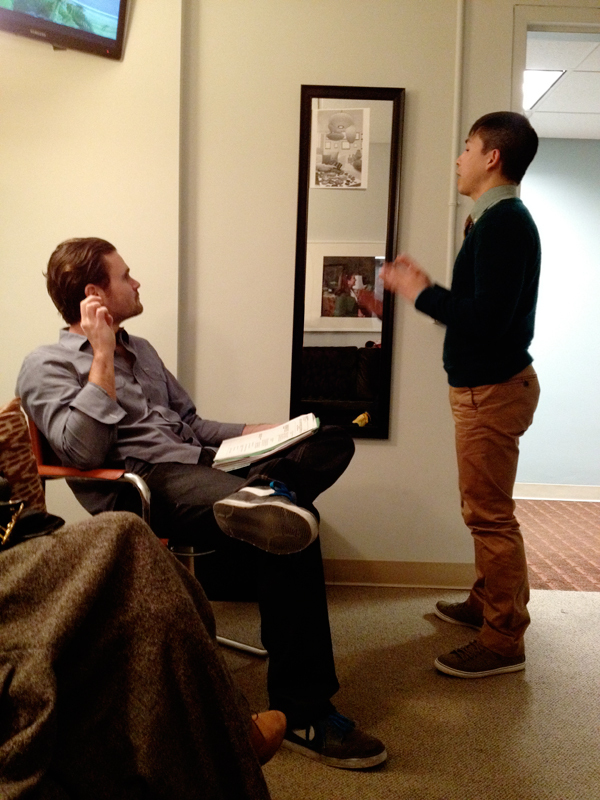 I rehearsed with Jordan, a producer on the show, in the green room before we rehearsed on set. He’s great. He gave me lots of tips. Here I am after the taping with Jordan and another producer. It was fun! It was hard work, and I had lots of help along the way from all my friends. I hope you enjoyed the show and the projects! Do you have any photos of the stages in making this light fixture? I can’t quite get my head around what type of take out container lid you are referring to or how you are assembling. 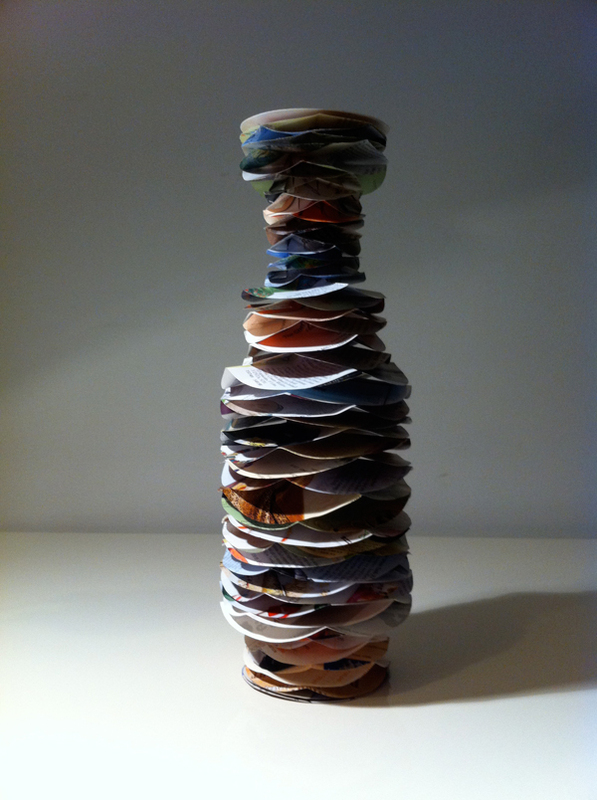 I would love to try making this if I can save up sixty six pack rings. I am with Nate in that up to now I ALWAYS cut them apart so the sea gulls at the dump don’t get their heads caught in them. Hi Judy! Thanks for asking. I’ve added a photo of the the take-out container lid. I’ll have to work on those pictures. Well, six-pack rings have been required by law to photodegrade, so if they do get stuck on an animal it should break apart with exposure to sunlight. I’m just not sure how long exactly that would take. But even if it photodegrades in a timely fashion the more serious issue is ingestion of little plastic bits by animals and also contribution to huge ocean garbage patches around the world. Until six-pack rings aren’t on the market anymore, the best thing to do is not to treat them as disposable items but as reusable resources so they actually stay out of the waste system. I had never heard of you/read your blog until I saw the segment today on the Nate show. Your projects and personal sense of style really caught my eye and I’ve enjoyed browsing your blog 🙂 Looks like you did a lot of prep for the segment and it showed. Keep up the good work! Hi, Katy. I’m the new kid on the block. 😀 I just officially launched last August. I’m so glad you found me! OH GOSH! It was a ton of work! Individually the projects are quite enjoyable to do, but imagine doing them all at once! It was tough! I loved all of your projects. I saw the show and I never watch. LOVE. I am going to make some fused plastic magic. Hi Paige! GOSH! Thanks for watching the show! I am so glad you loved it! OOO…you must tell me more of this magic magic you speak of! I have to say I think you are a genius! I love what you said on the show about keeping your eyes open for new ideas. I’m a photographer and that comment is so true! It is funny I have some piperlime boxes that have the coolest interior to them. I have been saving them because I told myself i’m going to do something with them. I just can’t throw them away because the interior of the box looks like wallpaper to me. You have given me some great ideas and thank you so much for describing how to do the fused plastic. That is going to come in so handy!! I’m so happy for you and I know being on the Nate Berkus show is going to make you a household name. If Nate loves you, you must be doing something right and by the looks of it you really are!! I can’t wait to see what you come up with next!! Hi Melissa! Genius? I don’t know if my IQ qualifies me for genius status, but I’ll take it! I know what you mean about shoes boxes. I love brown paper, paper bags, brown cardboard. I turn my shoe boxes inside out to hide distracting graphics and reveal the plain brown cardboard. SO…since you appreciate the insides of the boxes so much, take them apart, and reassemble them inside out! The fused plastic tutorial is in second place at the moment on the projects voting page. I’ll probably film it soon, if you need to see a step by step tutorial. But if you do start doing it and need any help at all, don’t hesitate to send me a note. I’m here to help you. Thanks so much for writing and for your vote of confidence, Melissa! It means a lot to me! I’ll continue sharing my ideas as long as you’ll let me. 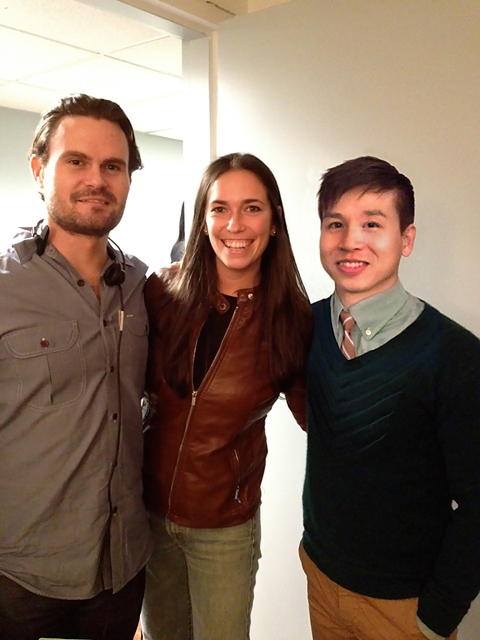 I happened to catch you on Nate’s show the other day, and I must say you were terrific! I loved all of your wonderful upcycling ideas, especially the awesome door knob/jar lids! Genius! (Melissa is spot on with her description of you). 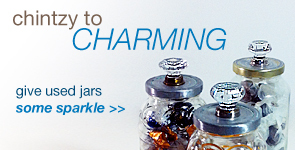 I love old knobs, handles, etc and will absolutely be making these jars! Hi Tia. Thanks for watching the show. I’m so glad you like my upcycling ideas. I’m working on the tutorial for the jars right now. It should be up in a few days. I love all that stuff too. Thank you so much for writing! Please send me an invite to pinterest. I am in love with your works and have made the projects you debuted on the Nate Berkas show challenge! I have turned on all my crafty friends to you. Please keep the projects coming. Hi Sonja! I hope you had fun making the projects. I’ve sent you an invite. Thank you so much for your support! I love the plaited bath mat. It would be great if you could put it up as a project. Hi Hester! I so glad. I really love that project too. Make sure to vote it up. I do my video tutorials based on the number of votes they get (http://www.relevedesign.com/upcoming-how-tos/). At the moment the project has 79 votes. In the mean time figure out what color t-shirts you want to use and start gathering and saving them. It takes quite a few for one mat. Thanks for taking the time to write! You have some amazing inventive decor – love your ideas! And best thing of all is that a lot of it is from everyday items that most people throw away (like dry cleaners hangers hehe). My favorites were the hangers picture frame hooks and the junk mail vase. I watched this show and was amazed by your talent. Congratulations! Nate indicated that instructions to all of the projects were going to be on his website, but I haven’t been able to find them. Since watching the show, I’ve been collecting 6-pack rings and I’m hoping that you’ll share the instructions with me for making this light fixture. Thanks. Hi, Debbie! Nate did have instructions on his site, but since the show was cancelled, it’s site was taken down and redirected to his current site. I’ve created a video tutorial that you can watch. 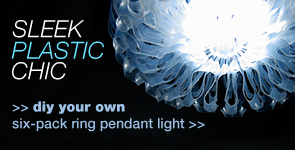 Check it out (http://www.relevedesign.com/how-to-make-six-pack-pendant-lights/). Thanks for watching my episode, and thanks so much for taking the time to write! Wanted to find instructions for making those pillows out of old dress shirts. Watching a rerun of the Nate Berkus show and I loved the pillows and all the other things as well. If you want to draw patterns on your shirts, you can use a bleach pen (https://www.clorox.com/products/clorox-bleach-pen-gel/). It works best on cotton. Thanks for watching the show and taking the time to visit and write!